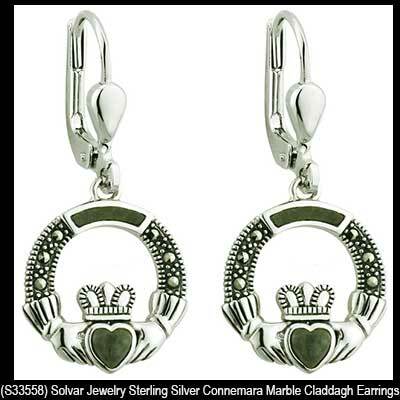 These sterling silver Connemara marble Claddagh earrings feature Ireland's green gem stone in the hearts along with additional marble and marcasite stone accenting. The sterling silver drop Claddagh earrings on latching Eurowires measure 1/2" wide x 1 1/4" tall, to the top of the wires. Sterling silver Claddagh necklace features a Connemara marble heart and accents along with marcasite stones.